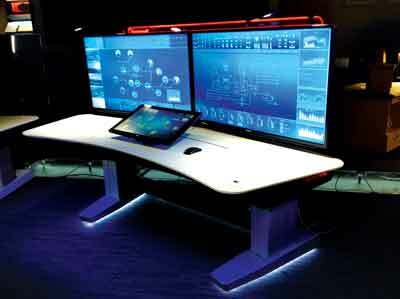 ICL Brasil, a large industrial minerals producer, will be the first in the world to use Honeywell’s state-of-the-art Experion Orion console, shown here, along with Honeywell’s Universal I/O technology to modernize its production facility in Cajati, near Sao Paulo. The upgrades are aimed at increasing production, improving efficiency and expanding the effectiveness of plant operators. Today, the main mission of most mineral producers is to survive in a fast-moving, hostile market environment, and some of the most promising weapons in their arsenal are emerging technologies that allow them to connect—taking advantage of better, quicker communications with all their productive assets; and collect—implementing cost-effective data collection and analysis that leads to better decision making. The authors went on to say that, “…in processing plants, our work suggests that many plant operators have blind spots in understanding the drivers of yield. By applying new mathematical techniques…we have found that plant yields of gold, nickel, phosphate, and other processed minerals can often be improved by 3%–10% within months.” To illustrate, they provided a case history (see sidebar). The rewards of digital innovation throughout the mining industry could be dramatic, according to McKinsey, “Capturing the value from digital innovations represents a fundamental shift in vision, strategy, operating model, and capabilities in the mining industry. In particular, much of the value creation in mining will shift from how well the operation moves material to how well it collects, analyzes, and acts on information to move material more productively. However, high-concept technologies almost always rest on a foundation of basic hardware, including the cables, connectors and secure housings, and boxes that link and protect data systems. Once those components are in place, companies need adaptable, comprehensive data analysis capabilities to assess information coming from both new and legacy I/O points, systems and sensors. E&MJ turned up a few recent examples of how producers are making sure that giga- and terabytes of potentially useful data reach the desired destination. Among the challenges to succeed in the industry is the ability to provide efficient “pit-to-port” infrastructure performance, which essentially means ensuring that minerals move seamlessly from the point of extraction to the facilities that can then move them to international market destinations. To provide such efficiencies, avoid human error and facilitate automated mining functions, producers are increasingly turning to fiber optic cable for “end-to-end” communications and control solutions. Many such solutions include ruggedized cable and connectors that ensure survival of fiber-based DCS/PLC automation/control architectures for various types of mining operations, even in the harshest environments. As industrial Ethernet and fiber optic cable emerge as the medium of choice in many industrial arenas, communication and control integration using the most appropriate products for a specific application is increasingly important. 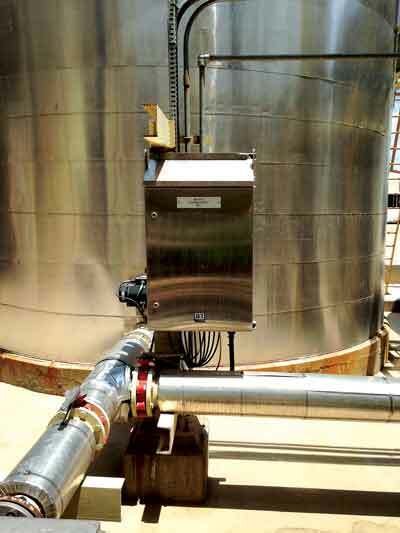 Datalek Systems & Electrical is responsible for the design, installation and maintenance of numerous fiber optic communications systems including those that involve automation, security, access control and CCTV systems for open-pit and underground mining operations as well as LNG and coal seam gas facilities. Also, fiber cable won’t cause an electrical spark, another advantage that makes it ideal for many mining applications. As fiber optic cable emerges as the medium of choice in many industrial arenas, the DIN rail enclosure plays an increasingly important role. Mounted to a standard DIN rail—the metal rail used to mount various electrical components (e.g., terminal blocks, motor starters, circuit breakers) in a control cabinet—a DIN rail enclosure provides a central location where external and internal wiring can be connected quickly and efficiently. Porach said OCC has developed a new, ruggedized line of DIN rail enclosures to provide highly secure terminations within a wide variety of industrial applications even in the most adverse environmental conditions. Available for both fiber optic and copper applications, this type of enclosure is easy to install and provides simple patching for the connection of all automation components in a patch field for the industrial automation environment. Customers can also order this enclosure as a complete assembly including connectors and fiber optic cables that are calibrated and pre-terminated at the factory. These assemblies are built according specifications that will meet the various environmental impacts of an application—noise from electric motors, highly flammable conditions or extreme temperatures. For applications where sensing and communications capabilities are critical, mining operations are increasingly deploying ruggedized fiber optic cable and DIN rail enclosures to interface with communications devices. With or without a DIN rail enclosure termination, fiber optic cable systems for the mining industry often include ruggedized or even military-grade cable and connectors. This type of cable is designed specifically for extreme environmental conditions- temperature, humidity, ice, fungus and fluid immersion. The cable contains MIL [military grade] type of fiber, which is double-jacketed and also covered with a bronze braid plus another on top. This top jacket may be a flame-retardant or a low-smoke, zero halogen jacket. This type of cable is designed to provide extra protection where heavy objects may be dropped on cables, or there is danger of the cable becoming sliced or nicked by sharp surfaces. In addition to having fiber optic cable with appropriate protection, mine operators need to have cable connectors and adapters that can withstand temperature extremes and many types of stresses, enabling systems to run and data to flow regardless of the harshness of the environment. Military-grade connectors and adapters may be required for some applications. These products feature non-optical disconnect, nickel-plated brass or stainless steel configurations that can withstand extreme temperature change, shock, vibration and corrosion. Successfully opening a gold mine anywhere in the world is no small feat. Getting an operation up and running ahead of schedule and under budget in Namibia is all the more impressive, B2Gold Corp. did that with its Otjikoto mine—licensed in 2012 with ground broken in April 2013, Otjikoto started initial production in December 2014, making it one of the fastest-moving projects in the history of Namibia’s mining industry. These stainless steel, weatherproof control cabinets installed at a B2Gold operation provide a ‘plug-andplay’ solution that allowed convenient and quick connection to existing equipment. Norgren, a global supplier of motion control systems now doing business as IMI Precision Engineering, played a role in this achievement by supplying an innovative, tailored total control package. Armed with extensive experience on similar mining projects, IMI Precision Engineering was confident it could provide a solution that would be both more cost effective and more efficient than what was required by the original specifications from Lycopodium, B2Gold’s EPCM. A subsidiary of the engineering group IMI PLC, IMI Precision Engineering has a sales and service network that extends throughout 75 countries, technical centers in the USA, Germany, U.K. and China, and manufacturing facilities around the world. “Lycopodium encouraged us to submit a bid because we had supplied a very successful package for them on a previous project,” said Gavin Snoxall, IMI Precision Engineering sales director for Australia. “We thought we could improve the design and lower the cost compared to the original specification.” Lycopodium and B2Gold accepted the separate control panel and air component supply-only bid because it met and exceeded their requirements while saving money and eliminating the need for multiple component suppliers. 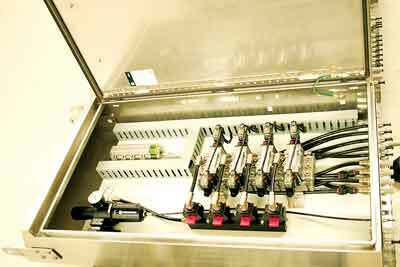 Ultimately, IMI Precision Engineering supplied actuators to operate pneumatic launder and diverter gates, as well as approximately 40 control panels. These control panels provide centralized operation for launder gates, diverter gates, and a series of localized control valves across Otjikoto’s beneficiation plant to control the flow of slurry and other solutions used to separate the mine’s gold from crushed ore. The centralized control panel packages are integrated into the plant’s master digital control system. If any component fails anywhere within the plant the problem is indicated by an electrical signal in the control loop—in this case a fault alarm will be indicated in the control room. Inside the cabinets, connections are low-voltage and safely adjustable by employees using simple tools. Controlling localized valve functions from several centralized locations also means maintenance and issue resolution can take place centrally, saving the mine time and therefore money. Because the panels contain no high voltage components, many parts can be adjusted by hand or a screwdriver. The “plug-and-play” design meant B2Gold could connect the unit to existing equipment without tools, and the units are easy to click on and off of their mounts. In addition, the cabinets that house the control panel components are stainless steel and weatherproof. The units have been trouble-free following installation. 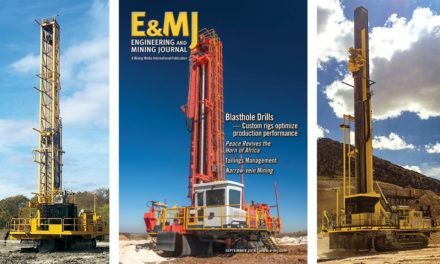 “The panels have performed to expectation with not a single issue throughout startup and operation,” according to Wayne Johansen, instrumentation superintendent for B2Gold Corp.
Companies are catching on: IntelliSense.io, a Cambridge, U.K.-based technology firm, recently announced that Antofagasta Minerals, Chile’s largest private mining group, had signed a strategic partnership to deploy IntelliSense.io analytics and digital technologies for their “Mine to Mill” operational efficiency program. 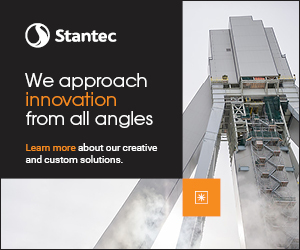 The technology will be deployed at Antofagasta’s Minera Centinela operation, initially targeting the thickener circuit. IntelliSense pointed out that, historically, mining has been slow to adopt technology innovations—compared with other industries such as manufacturing that have improved their productivity and efficiency by deploying information, communications and computing technologies. However, against the backdrop of an uncertain commodities market and after a year-long drop in the price of copper, Antofagasta Minerals found it opportune to invest in innovative technologies to improve operational efficiency. IntelliSense, whose technology is used to optimize processes and systems through a combination of sensors, software and simulation, can point to recent successes from its technology’s deployment in uranium mining, for example. The company explains that its applications combine real-time sensor data with sophisticated equipment and system models to deliver process insights. These insights are used to deliver optimization services that are tested on a virtual process simulation environment, eliminating implementation risks and ensuring adaptive process control. In the Antofagasta deployment, the technology is aimed at achieving optimal control of the thickener circuit with low variance via tracking, modeling and simulation of the system, taking into account input material, clay content, flocculant use and equipment operation. 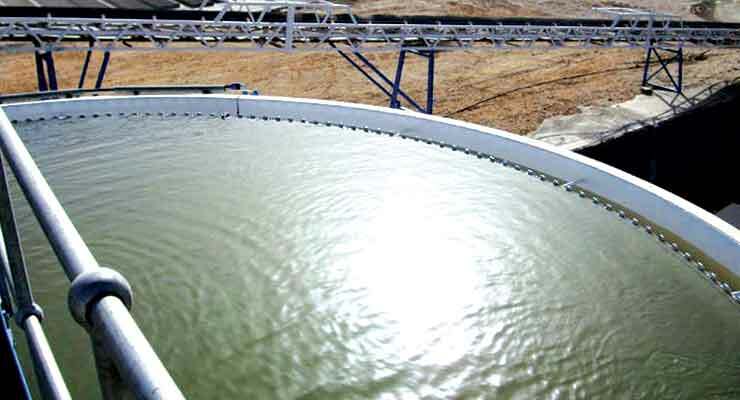 Expected results include delivery of thickened tailings at target percent solids, reduced flocculant consumption and implementation of condition-based thickener maintenance. According to Intellisense.io, its business model of delivering “Optimization applications as a Service” results in little to no upfront capex cost, faster deployment and continuous solution upgrades that deliver rapid ROI to their customers. A five-year strategic partnership agreement signed by the two companies will see IntelliSense.io working closely with Antofagasta Minerals on delivering needed technology across the mine extraction, mineral processing and waste management processes with the primary goal of improving efficiency, reducing environmental impact and delivering bottom line benefits to the mine operations. IntelliSense.io announced that it also is setting up a “Center of Excellence for Digital Technologies in Chile” that will serve the Latin American mining industry across copper, gold, iron ore and platinum mining operations. Portions of the information included in this article were provided to E&MJ on behalf of Optical Cable Corp., IMI Precision Engineering, IntelliSense.io, and Honeywell Process Solutions. Chilean copper producer Antofagasta Minerals will employ IntelliSense data analysis technology to improve thickener performance at one of its operations. The authors of the McKinsey & Co. article How Digital Innovation Can Improve Mining Productivity describe a gold mine under severe pressure because the gold grade of the orebody it was mining had fallen by around 20%. The mine had increased ore-production volumes to try to offset the decline, but it was running into difficulties because this was overloading its leaching plant and incurring higher costs on energy, chemicals, and other major input costs. 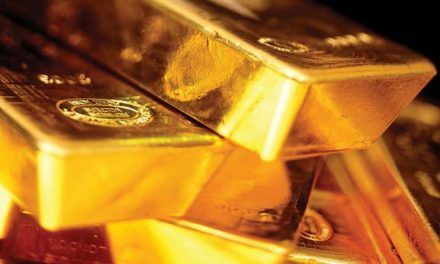 Taking an advanced-analytics approach enabled the mine to improve gold output in a different way: it optimized its leaching extraction process based on extensive data analyses and boosted its average yield by more than 3% within three months. 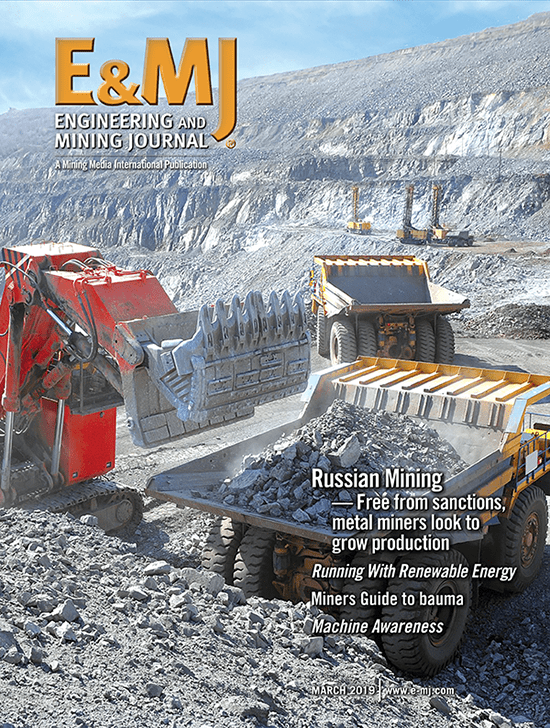 Across the industry, comparable application of advanced-analytics approaches to drive yield improvements for commodities with similarly complex ore-processing operations, such as copper, nickel, phosphate, and platinum, could translate to roughly $20 billion to $50 billion per year of additional earnings before interest, tax, and depreciation, according to the article’s authors.